Cyber-Flasher Personal Emotions Up_Date REV. !!! Thread: Cyber-Flasher Personal Emotions Up_Date REV. !!! Cyber-Flasher Personal Emotions INDONESIA BELUM MERDEKA !!! • Write or Repair IMEI 00000 + Include NV Repair One Job Fix signal calibrate (no server needed (0FFLINE)). • Write or Repair MEID + pESN write Include NV Repair One Job Fix signal calibrate (fix for some blackberry QC phone/no server needed (0FFLINE)). • All type blackberry model supported ( factory os ). 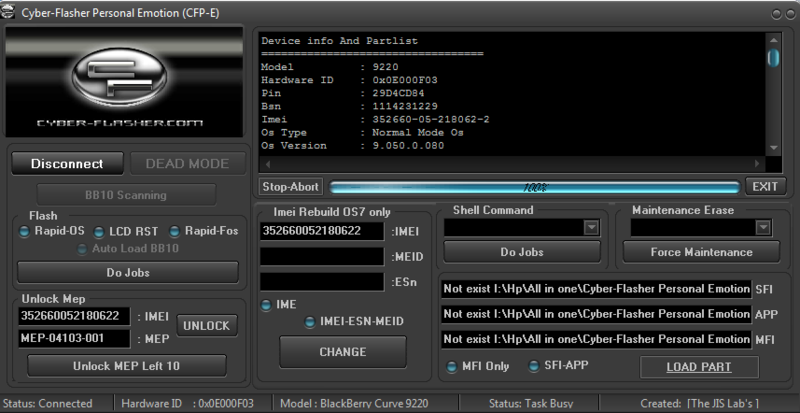 • All type blackberry model supported ( RAPID_OS ). • Repair Stuck 10% – 100% (non Disable). • Repair EFS Corrupt & Red Blink All OS. • Fixing Signal After Erase Modem EFS. • added blackberry 10 generation flashing stage. • Format User Area 4GB. • Format User Area 8GB. • Loader os ( mfi/sfi – app ) Flashing Added. • LCD Reset Auto Load. • Low Erase For FS Nand Fat ( non disable ). • Direct Unlock MEP Left 10 or above. Other Feature Next Soon Update....Disable-Enable Internal Memory (BIMS) , MEP Zero(0) Unlock , And More !!! Nb : Buat Yg Sdh Punya Versi Sblm nya,tinggal COPAS Yes To All Aja Ke 1 Folder CFP-E Anda,Lalu Hapus .exe Lama Anda. Have U Nice Day & Enjoy !!! Re: Cyber-Flasher Personal Emotions Up_Date REV. !!! pertamax....ini dia yg di tunggu2 update nya cyber flasher..